The Queen Street Dress is Here!! Today is the exciting day: The Queen Street Dress Pattern Release Day!! The pattern is live on Etsy and on Craftsy. As I mentioned in my last post, this is a wonderfully versatile dress that can be dressed up or down depending on which fabrics you choose, sewn with 3/4 length sleeves or short sleeves, can have a pleated front or gathered front and can be cut at dress length or blouse length. It has a modern vintage feel with it’s wide peter pan collar and optional pockets. I had some very awesome testers for this pattern and I want to share some of their pictures with you! Click here to head to Etsy and get the pattern or if you prefere, click here to go to Craftsy to get your copy! My second sewing pattern is coming out on Monday. 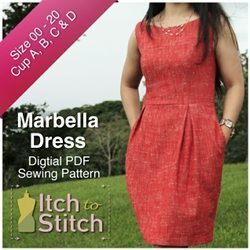 It’s called the Queen Street Dress Pattern! I wanted to go ahead and give you all a little introduction to the Queen Street before it makes it’s debut!! So, first, for a little background, I grew up in Charleston, SC and have named all of my patterns (the Emerson Dress and others to come) after places, things, and people of Charleston who inspired me as a kid! Queen Street in Charleston is one of the lovely downtown streets where a very nice restaurant is located, 82 Queen. The idea behind the Queen Street dress pattern is that you can dress it up with lovely fabrics to make it dressy enough to where to 82 Queen or make it casual enough to wear for a stroll down the street! The pattern features short sleeve or 3/4 length sleeve options, a professional looking button placket on the center back, a wide collar, a pleated or gathered front option and dress or blouse length options. With so many choices, you will be able to use this pattern again and again to create lovely charming dresses that have a modern vintage vibe.